The sandstone arch that is called Natural Bridge has stood for millenniums. The arch is 78 feet long, 65 feet high, 12 feet thick and 20 feet wide. Some geologists believe that the stunning natural sandstone arch is at least a million years old. There are other natural archways in the area, but none have gained the prominence of Natural Bridge. Since 1889, visitors have made the trip to the eastern Kentucky mountains to see this amazing natural wonder. 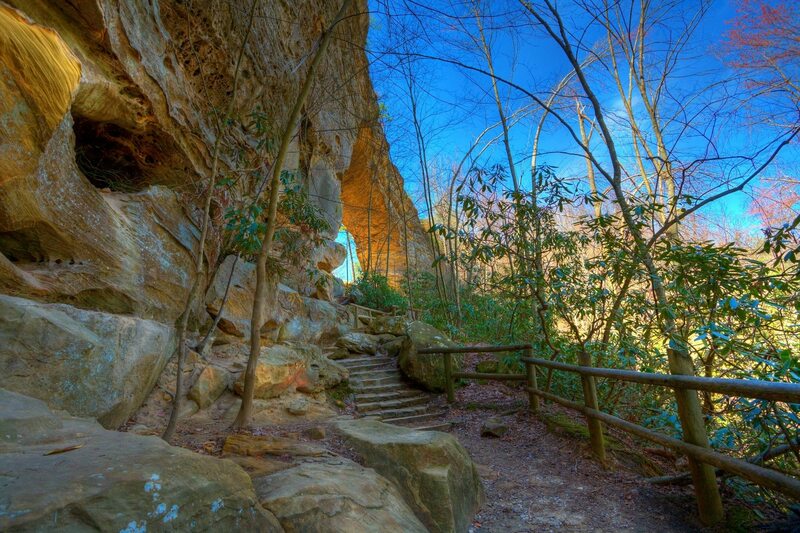 There are many things to do while visiting Natural Bridge State Park. Some of those include bird watching, hiking to the arch, fishing and swimming. Oh, and did we mention a sky lift? For a more relaxing climb to natural bridge, enjoy a ride on the sky lift. The ascent begins one-half mile from the park entrance and ends within 600 feet of Natural Bridge. Open daily first weekend of April through the last weekend in October. The awe-inspiring beauty of Natural Bridge State Resort Park is an inspiration to those who wish to see one of the great natural wonders of Kentucky. The Kentucky Nature Preserves Commission has set aside 1,188 acres within the park as a nature preserve. This not only protects, but also enhances the pristine beauty of this eastern Kentucky marvel.